Frooti, the Indian mango drink, is being promoted in a television commercial featuring Bollywood superstar Shahrukh Khan. 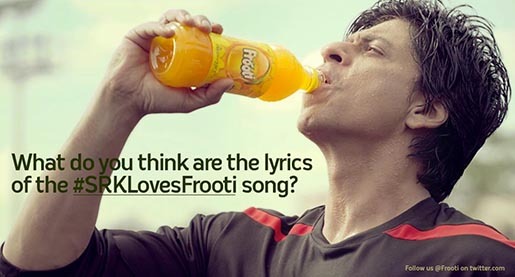 The film, shot after a game practice, intercuts between Shahrukh gulping Frooti and a bunch of little soccer players yearning for the mango drink. The little kids drool uncontrollably and their thirst for the bottle of Frooti seems unabashed. 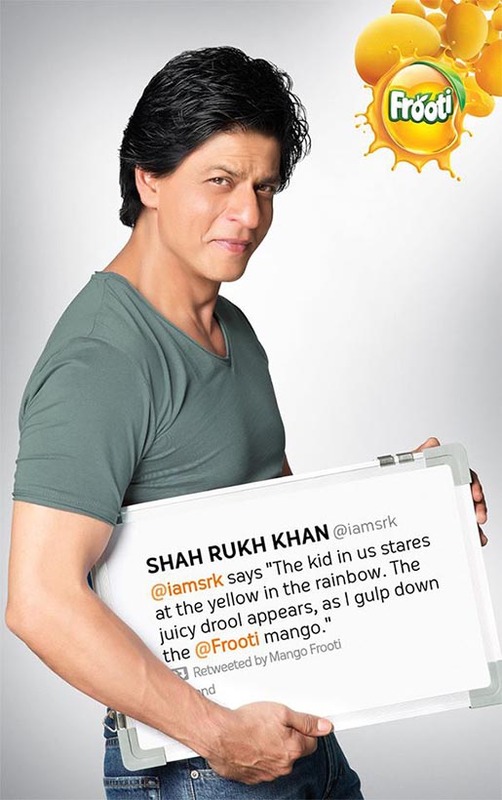 When Shahrukh is done with his Frooti and looks around, he is taken aback to see the players (who were actually adults) staring at him in child-like innocence. The film is backed by a holistic marketing plan which includes innovative outdoor, BTL, mall activation, visibility at Retail outlets (POP) and strong digital presence. Social media will be the focus of the communication plan, with activities on Twitter and Facebook. The Frooti campaign was developed at Creativeland Asia, Mumbai, led by creative chairman/creative director and copywriter Sajan RaJ Kurup, executive creative directors Anu Joseph and Vikram Gaikwad, creative director Rajat Dawar, creative director/art director Ravi Shanker (TV), art director Deepak Jage (digital), copywriter Riti Hamlai (digital), working with Nadia Chauhan, chief marketing officer at Parle Agro. Filming was shot by director Prakash Varma via Nirvana Films, Bangalore, with producer Sneha Iype, director of photography K.U. Mohanan, line producer Sunitha Ram, art director Manisha Kandhelwal, production manager Gemma Fonseca. Post production was done at After, Mumbai. Editor was Shyam (Sally) Salgaonkar at Prime Focus. Colorist was Navin Shetty at Pixion. Music, sung by Sharmishta, was produced by Amar Mangrulkar.